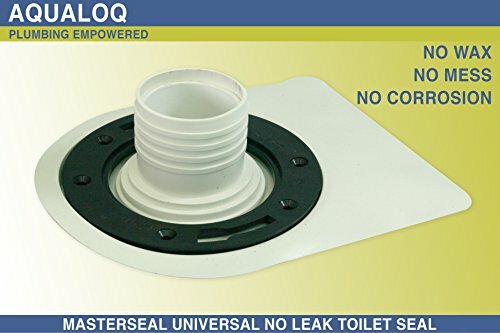 Aqualoq Airtight Toilet Seal - Wax Free - Reusable, Universal 3" & 4"
Product prices and availability are accurate as of 2019-04-02 21:51:45 EDT and are subject to change. Any price and availability information displayed on http://www.amazon.com/ at the time of purchase will apply to the purchase of this product. With the Aqualoq Masterseal Gasket, you will get a wax seal solution that is more dependable. It will also provide you with a more permanent rubber seal for your toilet. It comes with an extended spacer and discharge neck kit that allows you to make more secure connections irrespective of the height of your floor flange. When you install it you won’t need to get silicone for around the toilet. In this way, the Universal Wax Free Toilet Seal Gasket will save you time while preventing the buildup of humidity in your washroom. Actually, Aqualoq Masterseal only needs silicone under its rubber membrane. In this way, it will provide you with secure sealing while preventing the leakage of water to the floors below. Aqualoq Masterseal will give you complete protection and coverage. It comes with secure sealing that will ensure that you no longer have to worry about leaks, which cause such health hazards as the growth of mildew and mold. Since this gasket has no wax, it causes no mess. You can also install it easily, quickly, and cleanly. After installation, it will cover the surface under your toilet bowl – including the core where the drain passes through. 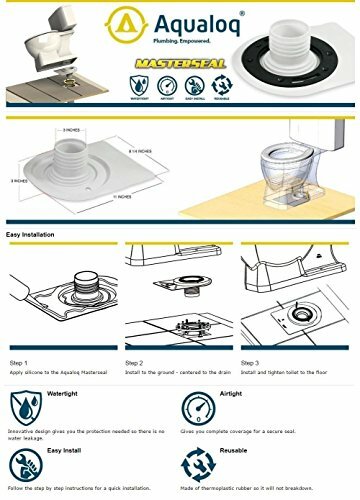 You can easily remove and reinstall Aqualoq Masterseal Universal Wax Free Toilet Seal Gasket with the same toilet seal. It is made of thermoplastic rubber, meaning it won’t corrode or breakdown.